Before :- R.C.Lahoti, CJI, B.N. Agrawal, H.K. Sema, G.P. Mathur & P.K. Balasubramanyan, JJ. (With Criminal Appeal Nos. 904/1998 & 1069-1070/1998) For the Appearing Parties :- Dr. A.M. Singhvi, T.L.V. Iyer, Y.P. Narula, Sr. Advocates with Joy Basu, Vinod Kumar, Rahul Tyagi, Madhurendra Kumar, B.K. Satija, V. Krishnamurthy, P.R. Kovilan, V. Balachandaran, Gopalakrishnan, Abhay Kumar, Subramonium Prasad, Abhijeet Chatterjee, Subodh Pathak, Ms. Seema Bengani, Chanchal Kr. Ganguly, Raghuvendra S. Srivastava, V. Senthil Kumar, V.J. Francis, P.I. Jose, Jenis V. Francis, Anupam Mishra, E.M.S. Anam, Shantha Kr. V. Mahale and Rajesh Mahale, Advocates. G.P. Mathur, J. - Leave granted in Special Leave Petition (Crl) No. 4111 of 2000. 2. In view of conflict of opinion between two decisions of this Court each rendered by a bench of three learned Judges in Surjit Singh v. Balbir Singh, 1996(3) RCR(Crl.) 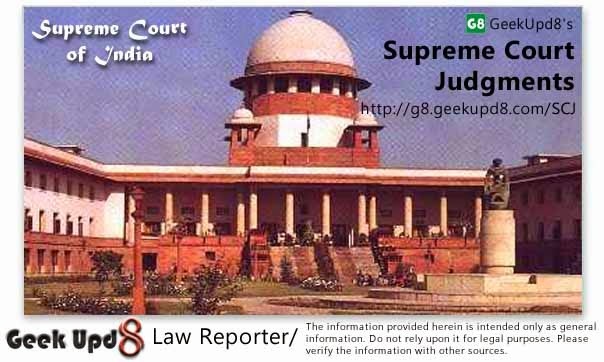 240 (SC) : 1996(3) SCC 533 and Sachida Nand Singh v. State of Bihar, 1998(1) RCR(Crl.) 823 (SC) : 1998(2) SCC 493, regarding interpretation of Section 195(1)(b)(ii) of Code of Criminal Procedure 1973 (for short 'Cr.P.C. '), this appeal has been placed before the present Bench. 3. The facts of the case may be noticed in brief. The appellant Nos. 1 and 2 are real brothers of Mukhtar Singh Marwah, while respondent Nos. 1 and 2 are his widow and son respectively. Mukhtar Singh Marwah died on 3.6.1993. The appellant No. 1 filed Probate Case No. 363 of 1993 in the Court of District Judge, Delhi, for being granted probate of the will allegedly executed by Mukhtar Singh Marwah on 20.1.1993. The petition was contested by the respondents on the ground that the will was forged. On their application the appellant No. 1 filed the original will in the Court of District Judge on 10.2.1994. Thereafter, the respondents moved an application under Section 340 Cr.P.C. requesting the Court to file a criminal complaint against appellant No. 1 as the will set up by him was forged. A reply to the said application was filed on 27.7.1994 but the application has not been disposed of so far. Thereafter, the respondents filed a criminal complaint in May 1996 in the Court of Chief Metropolitan Magistrate, New Delhi, for prosecution of the appellants and their mother Smt. Trilochan Kaur Marwah under Sections 192, 193, 463, 464, 465, 467, 469, 471, 499 and 500 IPC on the ground that the will of Mukhtar Singh Marwah set up by the appellants is a forged and fictitious document. It is stated in the complaint that though Mukhtar Singh Marwah was an educated person, but the will bears his thumb impression. He had accounts in Bank of Tokyo and Standard Chartered Bank which he used to operate by putting his signature. Under the will he had completely divested the respondents, who were his widow and son respectively and also a daughter who was spastic and had bequeathed his entire property to his mother and after her death to his brothers and sisters. The appellant No. 1 Iqbal Singh Marwah was appointed as the sole executor and trustee of the will. Before the learned Metropolitan Magistrate, the complainant examined six witnesses including two persons from the banks who brought the relevant records and deposed that Mukhtar Singh Marwah used to operate the accounts by putting his signature. The learned Metropolitan Magistrate held that as the question whether the will was a genuine document or a forged one, was an issue before the District Judge in the probate proceedings where the will had been filed, Sections 195(1)(b)(i) and (ii) Cr.P.C. operated as a bar for taking cognizance of the offences under Sections 192, 193, 463, 464, 471, 475 and 476 IPC. The complaint was accordingly dismissed by the order dated 2.5.1998. The respondents thereafter filed a criminal revision against the order of the learned Metropolitan Magistrate, before the Sessions Judge, who, relying upon Sachida Nand Singh v. State of Bihar, 1998(2) SCC 493 (supra), held that the bar contained in Section 195 (1)(b)(ii) Cr.P.C. would not apply where forgery of a document was committed before the said document was produced in Court. The revision petition was accordingly allowed and the matter was remanded to the Court of Metropolitan Magistrate for proceeding in accordance with law. The appellants challenged the order passed by the learned Additional Sessions Judge by filing a petition under Section 482 Cr.P.C. before Delhi High Court, but the same was dismissed on 15.9.2000 following the law laid down in Sachida Nand Singh. Feeling aggrieved, the appellants have preferred the present appeal in this Court. (iii) of any criminal conspiracy to commit, or attempt to commit, or the abetment of, any offence specified in sub-clause (i) or sub-clause (ii), except on the complaint in writing of that Court, or of some other Court to which that Court is subordinate." "It would thus be clear that for taking cognizance of an offence, the document, the foundation of forgery, if produced before the court or given in evidence, the bar of taking cognizance under Section 195(1)(b)(ii) gets attracted and the criminal court is prohibited from taking cognizance of offence unless a complaint in writing is filed as per the procedure prescribed under Section 340 of the Code by or on behalf of the Court. The object thereby is to preserve purity of the administration of justice and to allow the parties to adduce evidence in proof of certain documents without being compelled or intimidated to proceed with the judicial process. The bar of Section 195 is to take cognizance of the offence covered thereunder." to contend that once the document is produced or given in evidence in Court, the taking of cognizance on the basis of private complaint is completely barred. "11. The scope of the preliminary enquiry envisaged in Section 340(1) of the Code is to ascertain whether any offence affecting administration of justice has been committed in respect of a document produced in court or given in evidence in a proceeding in that Court. In other words, the offence should have been committed during the time when the document was in custodia legis. 12. It would be a strained thinking that any offence involving forgery of a document if committed far outside the precincts of the Court and long before its production in the Court, could also be treated as one affecting administration of justice merely because that document later reached the court records. 23. The sequitur of the above discussion is that the bar contained in Section 195(1)(b)(ii) of the Code is not applicable to a case where forgery of the document was committed before the document was produced in a court." 6. On a plain reading clause (b)(ii) of sub-section (1) of Section 195 is capable of two interpretations. One possible interpretation is that when an offence described in Section 463 or punishable under Section 471, Section 475 or Section 476 IPC is alleged to have been committed in respect of a document which is subsequently produced or given in evidence in a proceeding in any Court, a complaint by the Court would be necessary. The other possible interpretation is that when a document has been produced or given in evidence in a proceeding in any Court and thereafter an offence described as aforesaid is committed in respect thereof, a complaint by the Court would be necessary. On this interpretation if the offence as described in the Section is committed prior to production or giving in evidence of the document in Court, no complaint by Court would be necessary and a private complaint would be maintainable. The question which requires consideration is which of the two interpretations should be accepted having regard to the scheme of the Act and object sought to be achieved. 7. Dr. A.M. Singhvi, learned senior counsel for the appellants, submitted that the purpose of Section 195 is to bar private prosecution where the cause of justice is sought to be perverted leaving it to the Court itself to uphold its dignity and prestige. If a very restricted interpretation is given to Section 195(1)(b)(ii) Cr.P.C., as held in Sachida Nand Singh, the protection afforded by the provision will be virtually reduced to a vanishing point, defeating the very object of the enactment. The provision, it is urged, does not completely bar the prosecution of a person who has committed an offence of the type described thereunder, but introduces a safeguard in the sense that he can be so prosecuted only on the complaint of the Court where the document has been produced or given in evidence or of some other Court to which that Court is subordinate. Learned counsel has also submitted that being a penal provision, giving a restricted meaning as held in Sachida Nand Singh, would not be proper as a person accused of having committed an offence would be deprived of the protection given to him by the legislature. He has also submitted that on the aforesaid view there is a possibility of conflicting findings being recorded by the civil or revenue Court where the document has been produced or given in evidence and that recorded by the criminal Court on the basis of private complaint and therefore an effort should be made to interpret the Section in the manner which avoids such a possibility. 8. Shri Y.P. Narula, learned counsel for the respondents has submitted that the language of the Section is clear and there being no ambiguity therein, the only possible manner in which it can be interpreted is that the complaint by a Court would be necessary when the offences enumerated in the Section are committed at a time when the document has already been produced or given in evidence in Court i.e. when it is in the proceedings of the Court. The provision has to be strictly construed as it creates a bar on the power of the Court to take cognizance of an offence and any provision which ousts the jurisdiction of the Court, which it otherwise possesses, must be strictly construed and cannot be given an enlarged meaning. Since the provision deprives a person who is a victim and is aggrieved by the offences described under Section 463 or punishable under Sections 471, 475 or 476 IPC to initiate a criminal prosecution by filing a complaint, his interest cannot be overlooked and therefore the provision should not be given an enlarged meaning, but only a restricted meaning should be given. Learned counsel has also submitted that in certain situations where the forgery has been committed at any time prior to the production or giving in evidence of the document in Court, it may not at all be possible for such Court to effectively form an opinion as to whether it is expedient to file a complaint and that may facilitate the escape of a guilty person. Shri Narula has also submitted that in Sachida Nand Singh, the Court has reiterated and has adopted the same view which has been taken in several earlier decisions of this Court, and only in Surjit Singh a discordant note has been struck which is not correct. 9. The scheme of the statutory provision may now be examined. Broadly, Section 195 Cr.P.C. deals with three distinct categories of offences which have been described in clauses (a), (b)(i) and (b)(ii) and they relate to (1) contempt of lawful authority of public servants, (2) offences against public justice, and (3) offences relating to documents given in evidence. Clause (a) deals with offences punishable under Sections 172 to 188 IPC which occur in Chapter X of the IPC and the heading of the Chapter is - 'Of Contempts Of The Lawful Authority Of Public Servants'. These are offences which directly affect the functioning of or discharge of lawful duties of a public servant. Clause (b)(i) refers to offences in Chapter XI of IPC which is headed as - 'Of False Evidence And Offences Against Public Justice'. The offences mentioned in this clause clearly relate to giving or fabricating false evidence or making a false declaration in any judicial proceeding or before a Court of justice or before a public servant who is bound or authorized by law to receive such declaration, and also to some other offences which have a direct co-relation with the proceedings in a Court of justice (Sections 205 and 211 IPC). This being the scheme of two provisions or clauses of Section 195, viz., that the offence should be such which has direct bearing or affects the functioning or discharge of lawful duties of a public servant or has a direct correlation with the proceedings in a court of justice, the expression "when such offence is alleged to have been committed in respect of a document produced or given in evidence in a proceeding in a Court" occurring in clause (b)(ii) should normally mean commission of such an offence after the document has actually been produced or given in evidence in the Court. The situation or contingency where an offence as enumerated in this clause has already been committed earlier and later on the document is produced or is given in evidence in Court, does not appear to be in tune with clauses (a)(i) and (b)(i) and consequently with the scheme of Section 195 Cr.P.C. This indicates that clause (b)(ii) contemplates a situation where the offences enumerated therein are committed with respect to a document subsequent to its production or giving in evidence in a proceeding in any Court. 10. Section 195(1) mandates a complaint in writing of the Court for taking cognizance of the offences enumerated in clauses (b) (i) and (b)(ii) thereof. Sections 340 and 341 Cr.P.C. which occur in Chapter XXVI give the procedure for filing of the complaint and other matters connected therewith. The heading of this Chapter is - 'Provisions As To Offences Affecting The Administration Of Justice'. Though, as a general rule, the language employed in a heading cannot be used to give a different effect to clear words of the Section where there cannot be any doubt as to their ordinary meaning, but they are not to be treated as if they were marginal notes or were introduced into the Act merely for the purpose of classifying the enactments. They constitute an important part of the Act itself, and may be read not only as explaining the Sections which immediately follow them, as a preamble to a statute may be looked to explain its enactments, but as affording a better key to the constructions of the Sections which follow them than might be afforded by a mere preamble. (See Craies on Statute Law, 7th Ed. Pages 207, 209). The fact that the procedure for filing a complaint by Court has been provided in Chapter XXVI dealing with offences affecting administration of justice, is a clear pointer of the legislative intent that the offence committed should be of such type which directly affects the administration of justice, viz., which is committed after the document is produced or given in evidence in Court. Any offence committed with respect to a document at a time prior to its production or giving in evidence in Court cannot, strictly speaking, be said to be an offence affecting the administration of justice. (c) Prosecution for certain offences relating to documents given in evidence. - of any offence described in Section 463 or punishable under Section 471, Section 475 or Section 476 of the same Code, when such offence is alleged to have been committed by a party to any proceeding in any Court in respect of a document produced or given in evidence in such proceeding, except on the complaint in writing of such Court, or of some other Court to which such Court is subordinate"
It may be noticed that language used in Section 195(1)(b)(ii) Cr.P.C. is similar to the above provision except that the words "by a party to any proceeding in any Court" occurring therein have been omitted. We will advert to the effect of this omission later on. "(i) The underlying purpose of enacting Section 195(1)(b) and (c) Section 476 seems to be to control the temptation on the part of the private parties to start criminal prosecution on frivolous vexations or unsufficient grounds inspired by a revengeful desire to harass or spite their opponents. These offences have been selected for the court's control because of their direct impact on the judicial process. It is the judicial process or the administration of public justice which is the direct and immediate object or the victim of these offences. As the purity of the proceedings of the court is directly sullied by the crime, the court is considered to be the only party entitled to consider the desirability of complaining against the guilty party. The private party who might ultimately suffer can persuade the Civil Court to file complaint. (ii) the offences about which the court alone is clothed with the right to complain may, therefore, be appropriately considered to be only those offences committed by a party to a proceeding in that court, the commission of which has a reasonably close nexus with the proceeding in that court so that it can without embarking upon a completely independent and fresh inquiry, satisfactorily consider by reference principally to its records the expediency of prosecuting the delinquent party. It, therefore, appears to be more appropriate to adopt the strict construction of confirming the prohibition contained in Section 195(1)(c) only to those cases in which the offences specified therein were committed by a party to the proceeding in character as such party. The Legislature could not have intended to extend the prohibition contained in Section 195(1)(c) to the offences mentioned therein, when committed by a party to a proceeding in that court prior to his becoming such party." The court clearly rejected any construction being placed on the provision by which a document forged before the commencement of the proceeding in which it may happen to be used in evidence later on, to come within the purview of Section 195, as that would unreasonably restrict the right to initiate prosecution possessed by a person and recognized by Section 190 Cr.P.C. 13. The aforesaid decision was considered in Raghunath v. State of U.P., 1973(1) SCC 564. Here, the accused had obtained sale deed of the property of a widow by setting up of an imposter and thereafter filed a mutation application before the Tehsildar The widow contested the mutation application on the ground that she had never executed the sale deed and thereafter filed a criminal complaint under Sections 465, 468 and 471 IPC in which the accused were convicted. In appeal, it was contended that the private complaint was barred by virtue of Section 195(1)(c) Cr.P.C. and the revenue court alone could have filed the complaint. The court repelled the aforesaid contention after relying upon the ratio of Patel Lalji Bhai v. State of Gujarat and the private complaint was held to be maintainable. In Mohan Lal v. State of Rajasthan, 1974(3) SCC 628, the above noted two decisions were relied upon for holding that provisions of Section 195(1)(c) (old Code) would not be applicable where mutation proceedings were commenced after a will had been forged. In Legal Remembrancer, Govt. of West Bengal v. Haridas Mundra, 1976(1) SCC 555 Bhagwati, J. (as His Lordship then was), speaking for a three Judge Bench observed that earlier there was divergence of opinion in various High Courts, but the same was set at rest by this Court in Patel Lalji Bhai Somabhai (supra) and approved the view taken therein that the words of Section 195(1)(c) clearly meant the offence alleged to have been committed by a party to the proceeding in his character as such party, i.e. after having become a party to the proceeding, and Sections 195(1)(c), 476 and 476-A (of the old Code) read together indicated beyond doubt that the legislature could not have intended to extend the prohibition contained in Section 195(1)(c) to the offences mentioned in the said Section when committed by a party to a proceeding prior to his becoming such party. Similar view has been taken in Mahadev Bapuji Mahajan v. State of Maharashtra, 1994(2) RCR(Crl.) 673 (SC) : 1994(3) Supp SCC 748 where the contention that the absence of a complaint by the revenue court was a bar to taking cognizance by the criminal court in respect of offences under Sections 446, 468, 471 read with Section 120-B IPC which were committed even before the start of the proceedings before the revenue court, was not accepted. 14. Dr. Singhvi, learned senior counsel for the appellants, in support of his contention has placed strong reliance on Gopalkrishna Menon v. D. Raja Reddy, 1983(4) SCC 240 which is a decision rendered by a Bench of two learned Judges. In this case, the appellants filed a civil suit for refund of Rs. 20,000/- which they claimed to have deposited with the first respondent and for recovery of certain amount. Along with the plaint the appellants produced a receipt for Rs. 20,000/- in support of their claim. Thereafter the first respondent filed a criminal complaint against the appellants alleging forgery of his signature on the money receipt and thereby commission of offences punishable under Sections 467 and 471 IPC. The appellants moved the High Court for quashing of the proceedings on the ground that in absence of a complaint by the court, the prosecution was barred under Section 195(1)(b)(ii) Cr.P.C. The High Court dismissed the petition holding that Section 463 cannot be construed to include Section 467 IPC as well and, therefore, the Magistrate was competent to take cognizance on the complaint. This Court reversed the view taken by the High Court observing that as Section 463 defines the offence of forgery and Section 467 punishes forgery of a particular category, Section 195(1)(b)(ii) Cr.P.C. would be attracted and in the absence of a complaint by the Court the prosecution would not be maintainable. After briefly referring to Patel Lalji Bhai (supra), the Court observed that "not the conclusion but the ratio" of the said case supported the view taken by it. The judgment does not show that applicability of Section 195(1)(b)(ii) was examined with regard to the question as to whether the alleged forged receipt was prepared before or after commencement of the civil suit, nor any such principle has been laid down that the bar would operate even if the forgery was committed prior to commencement of the proceeding in the civil court. 15. The other case which is the sheet-anchor of the argument of learned counsel for the appellants is Surjit Singh v. Balbir Singh, 1996(3) SCC 533 (supra). The facts as stated in paras 1 & 11 of the report show that a criminal complaint was filed by the respondent under Sections 420, 467, 468, 471 read with 120-B IPC alleging that the appellants had conspired and fabricated an agreement dated 26.7.1978 and had forged the signature of Smt. Dalip Kaur and on the basis thereof, they had made a claim to remain in possession of a house. The Magistrate took cognizance of the offence on 27.9.1983. The appellants thereafter filed a civil suit on 9.2.1984 wherein they produced the agreement. It may be noticed that the cognizance by the criminal Court had been taken much before filing of the Civil Suit wherein the agreement had been filed. During the course of discussion, the court not only noticed Gopalkrishna Menon (supra), but also quoted extensively from Patel Lalji Bhai (supra). Reference was then made to Sanmukh Singh v. The King, AIR 1950 Privy Council 31 and Sushil Kumar v. State of Haryana, 1988(1) RCR(Crl.) 113 (SC) : AIR 1988 SC 419 wherein it has been held that the bar of Section 195 would not apply if the original document had not been produced or given in evidence in Court. Then comes the passage in the judgment (para 10 of the reports) which we have reproduced in the earlier part of our judgment. The observations therein should not be understood as laying down anything contrary to what has been held in Patel Lalji Bhai, but was made in the context that bar contained in Section 195(1)(b)(ii) would not be attracted unless the original document was filed. It is for this reason that in the very next paragraph, after observing that the cognizance had been taken prior to filing of the civil suit and the original agreement in Court, the view taken by the High Court that the Magistrate could proceed with the trial of the criminal case was upheld and the appeal was dismissed. "15.39 The purpose of the section is to bar private prosecutions where the course of justice is sought to be perverted leaving to the court itself to uphold its dignity and prestige. On principle there is no reason why the safeguard in clause (c) should not apply to offences committed by witnesses also. Witnesses need as much protection against vexatious prosecutions as parties and the court should have as much control over the acts of witnesses that enter as a component of a judicial proceeding, as over the acts of parties. If, therefore, the provisions of clause (c) are extended to witnesses, the extension would be in conformity with the broad principle which forms the basis of Section 195." Since the object of deletion of the words "by a party to any proceeding in any Court" occurring in Section 195(1)(c) of the old Code is to afford protection to witnesses also, the interpretation placed on the said provision in the earlier decisions would still hold good. (e) bind over any person to appear and give evidence before such Magistrate. (2) The power conferred on a Court by sub-section (1) in respect of an offence may, in any case where that Court has neither made a complaint under sub- section (1) in respect of that offence nor rejected an application for the making of such complaint, be exercised by the Court to which such former Court is subordinate within the meaning of sub-section (4) of Section 195." Section 341 Cr.P.C. provides for an appeal to the Court to which such former Court is subordinate within the meaning of sub-section (4) of Section 195, against the order refusing to make a complaint or against an order directing filing of a complaint and in such appeal the superior Court may direct withdrawal of the complaint or making of the complaint. Sub-section (2) of Section 343 lays down that when it is brought to the notice of a Magistrate to whom a complaint has been made under Section 340 or 341 that an appeal is pending against the decision arrived at in the judicial proceeding out of which the matter has arisen, he may, if he thinks fit, at any stage, adjourn the hearing of the case until such appeal is decided. 18. In view of the language used in Section 340 Cr.P.C. the Court is not bound to make a complaint regarding commission of an offence referred to in Section 195(1)(b), as the Section is conditioned by the words "Court is of opinion that it is expedient in the interest of justice." This shows that such a course will be adopted only if the interest of justice requires and not in every case. Before filing of the complaint, the Court may hold a preliminary enquiry and record a finding to the effect that it is expedient in the interests of justice that enquiry should be made into any of the offences referred to in Section 195(i)(b). This expediency will normally be judged by the Court by weighing not the magnitude of injury suffered by the person affected by such forgery or forged document, but having regard to the effect or impact, such commission of offence has upon administration of justice. It is possible that such forged document or forgery may cause a very serious or substantial injury to a person in the sense that it may deprive him of a very valuable property or status or the like, but such document may be just a piece of evidence produced or given in evidence in Court, where voluminous evidence may have been adduced and the effect of such piece of evidence on the broad concept of administration of justice may be minimal. In such circumstances, the Court may not consider it expedient in the interest of justice to make a complaint. The broad view of clause (b)(ii), as canvassed by learned counsel for the appellants, would render the victim of such forgery or forged document remedyless. Any interpretation which leads to a situation where a victim of a crime is rendered remedyless, has to be discarded. 19. There is another consideration which has to be kept in mind. Sub-section (1) of Section 340 Cr.P.C. contemplates holding of a preliminary enquiry. Normally, a direction for filing of a complaint is not made during the pendency of the proceeding before the Court and this is done at the stage when the proceeding is concluded and the final judgment is rendered. Section 341 provides for an appeal against an order directing filing of the complaint. The hearing and ultimate decision of the appeal is bound to take time. Section 343(2) confers a discretion upon a Court trying the complaint to adjourn the hearing of the case if it is brought to its notice that an appeal is pending against the decision arrived at in the judicial proceeding out of which the matter has arisen. In view of these provisions, the complaint case may not proceed at all for decades specially in matters arising out of civil suits where decisions are challenged in successive appellate fora which are time consuming. It is also to be noticed that there is no provision of appeal against an order passed under Section 343(2), whereby hearing of the case is adjourned until the decision of the appeal. These provisions show that, in reality, the procedure prescribed for filing a complaint by the Court is such that it may not fructify in the actual trial of the offender for an unusually long period. Delay in prosecution of a guilty person comes to his advantage as witnesses become reluctant to give evidence and the evidence gets lost. This important consideration dissuades us from accepting the broad interpretation sought to be placed upon clause (b)(ii). 20. An enlarged interpretation to Section 195(1)(b)(ii), whereby the bar created by the said provision would also operate where after commission of an act of forgery the document is subsequently produced in Court, is capable of great misuse. As pointed out in Sachida Nand Singh, after preparing a forged document or committing an act of forgery, a person may manage to get a proceeding instituted in any civil, criminal or revenue court, either by himself or through someone set up by him and simply file the document in the said proceeding. He would thus be protected from prosecution, either at the instance of a private party or the police until the Court, where the document has been filed, itself chooses to file a complaint. The litigation may be a prolonged one due to which the actual trial of such a person may be delayed indefinitely. Such an interpretation would he highly detrimental to the interest of society at large. "The court seeks to avoid a construction of an enactment that produces an unworkable or impracticable result, since this is unlikely to have been intended by Parliament. Sometimes however, there are overriding reasons for applying such a construction, for example where it appears that Parliament really intended it or the literal meaning is too strong." "Parliament is taken not to intend the carrying out of its enactments to be unworkable or impracticable, so the court will be slow to find in favour of a construction that leads to these consequences. This follows the path taken by judges in developing the common law. ...the common law of England has not always developed on strictly logical lines, and where the logic leads down a path that is beset with practical difficulties the courts have not been frightened to turn aside and seek the pragmatic solution that will best serve the needs of society." In S.J. Grange Ltd. v. Customs and Excise Commissioners, (1979)2 All ER 91, while interpreting a provision in the Finance Act, 1972, Lord Denning observed that if the literal construction leads to impracticable results, it would be necessary to do little adjustment so as to make the section workable. Therefore, in order that a victim of a crime of forgery, namely, the person aggrieved is able to exercise his right conferred by law to initiate prosecution of the offender, it is necessary to place a restrictive interpretation on clause (b)(ii). "But penal statutes must never be construed so as to narrow the words of the statute to the exclusion of cases which those words in their ordinary acceptations would comprehend. ......... But where the thing is brought within the words and within the spirit, there a penal enactment is to be construed, like any other instrument, according to the fair commonsense meaning of the language used, and the court is not to find or make any doubt or ambiguity in the language of a penal statute, where such doubt or ambiguity would clearly not be found or made in the same language in any other instrument." In Lalita Jalan v. Bombay Gas Co., 2003(3) RCR(Crl.) 76 (SC) : 2003(6) SCC 107 this question was examined in considerable detail and it was held that the principle that a statute enacting an offence or imposing a penalty is to be strictly construed is not of universal application which must necessarily be observed in every case. The Court after referring to Murlidhar Meghraj Loya v. State of Maharasthra, AIR 1976 SC 1929, Kisan Trimbak Kothula v. State of Maharashtra, AIR 1977 SC 435, Superintendent and Remembrancer of Legal Affairs to Govt. of West Bengal v. Abani Maity, AIR 1979 SC 1029 and State of Maharashtra v. Natwarlal Damodardas Soni, AIR 1980 SC 593 held that the penal provisions should be construed in a manner which will suppress the mischief and advance the object which the legislature had in view. 23. That apart, the section which we are required to interpret is not a penal provision but is part of a procedural law, namely, Code of Criminal Procedure which elaborately gives the procedure for trial of criminal cases. The provision only creates a bar against taking cognizance of an offence in certain specified situations except upon complaint by Court. A penal statute is one upon which an action for penalties can be brought by a public officer or by a person aggrieved and a penal act in its wider sense includes every statute creating an offence against the State, whatever is the character of the penalty for the offence. The principle that a penal statute should be strictly construed, as projected by the learned counsel for the appellants can, therefore, have no application here. "(15) As between the civil and the criminal proceedings we are of the opinion that the criminal matters should be given precedence. There is some difference of opinion in the High Courts of India on this point. No hard and fast rule can be laid down but we do not consider that the possibility of conflicting decisions in the civil and criminal Courts is a relevant consideration. The law envisages such an eventuality when it expressly refrains from making the decision of one Court binding on the other, or even relevant, except for certain limited purposes, such as sentence or damages. The only relevant consideration here is the likelihood of embarrassment. (16) Another factor which weighs with us is that a civil suit often drags on for years and it is undesirable that a criminal prosecution should wait till everybody concerned has forgotten all about the crime. The public interests demand that criminal justice should be swift and sure; that the guilty should be punished while the events are still fresh in the public mind and that the innocent should be absolved as early as is consistent with a fair and impartial trial. Another reason is that it is undesirable to let things slide till memories have grown too dim to trust. This, however, is not a hard and fast rule. Special considerations obtaining in any particular case might make some other course more expedient and just. For example, the civil case or the other criminal proceeding may be so near its end as to make it inexpedient to stay it in order to give precedence to a prosecution ordered under Section 476. But in this case we are of the view that the civil suits should be stayed till the criminal proceedings have finished." 25. In view of the discussion made above, we are of the opinion that Sachida Nand Singh has been correctly decided and the view taken therein is the correct view. Section 195(1)(b)(ii) Cr.P.C. would be attracted only when the offences enumerated in the said provision have been committed with respect to a document after it has been produced or given in evidence in a proceeding in any Court i.e. during the time when the document was in custodia legis. 26. In the present case, the will has been produced in the Court subsequently. It is nobody's case that any offence as enumerated in Section 195(b)(ii) was committed in respect to the said will after it had been produced or filed in the Court of District Judge. Therefore, the bar created by Section 195(1)(b)(ii) Cr.P.C. would not come into play and there is no embargo on the power of the Court to take cognizance of the offence on the basis of the complaint filed by the respondents. The view taken by the learned Additional Sessions Judge and the High Court is perfectly correct and calls for no interference. 27. The appeal is, accordingly, dismissed. 28. This appeal has been preferred by the complainant against the judgment and order dated 6.2.1998 of the Madras High Court by which the criminal revision petition preferred by the second respondent Ramaraj was allowed and he was acquitted of the charges under Section 467 and 471 IPC on the ground that in view of the bar created by Section 195(1)(b)(ii) Cr.P.C., the learned Magistrate could not have taken cognizance on the police report. According to the case of the prosecution, the sale deed had been forged earlier and thereafter the same was filed in the Civil Court. For the reasons already discussed, the appeal is allowed and the judgment of the High Court is set aside. The criminal revision petition filed by the second respondent shall be heard and decided by the High Court afresh and in accordance with law. 30. The High Court in the impugned order dismissed the petition filed by the appellant under Section 482 Cr.P.C. relying upon the decision of this Court in Sachida Nand Singh. In view of the reasons already discussed, the appeals lack merit and are hereby dismissed.